Only a few radio receivers on market can receive the SAQ’s frequency of 17.2 kHz directly, usually special and expensive receivers. The normal solution for the reception of the SAQ is to use a converter, which converts the signal at 17.2 kHz to a frequency that can be received on a receiver that is at hand. In Twente in the Netherlands there is a receiver of long wave, medium wave and short wave signals, continousely transmitting these signals on the internet. 4. In the field “Frequency” enter 17.2 kHz (use dot) and hit the Enter key. 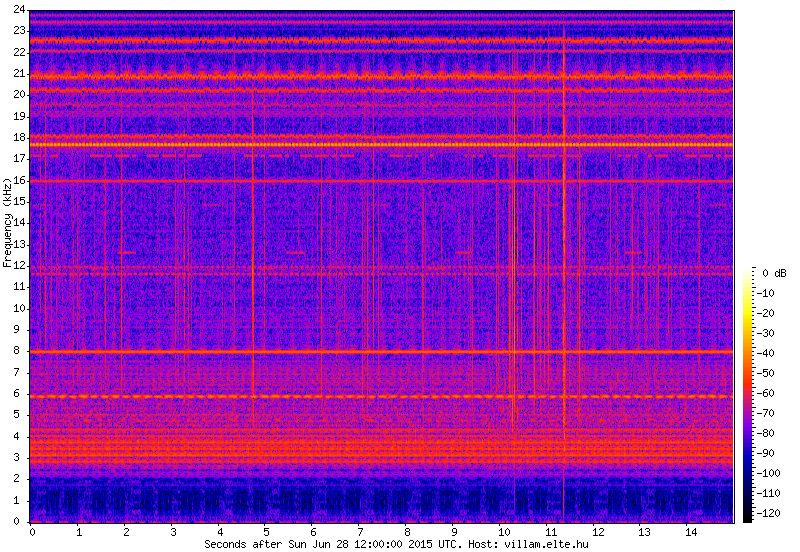 In recent years, a different solution to the reception of the SAQ has become increasingly common in listening to the reports, namely using a standard PC with a sound card with a computer program for spectral analysis. Sound cards are designed to handle frequencies up to about 24 kHz. Moreover, it turns out that sound cards often have a very low noise level, -100 dB or better, which means that an antenna can be connected directly to the sound card’s input signal without any additional amplifier. There are several spektralanalysprogram for free download via the Internet. SAQrx is a program that is free to download and easy to use. VLF image Budapest 2015-06-28 12:00 UTC. Note the Morse code at 17,2 kHz. 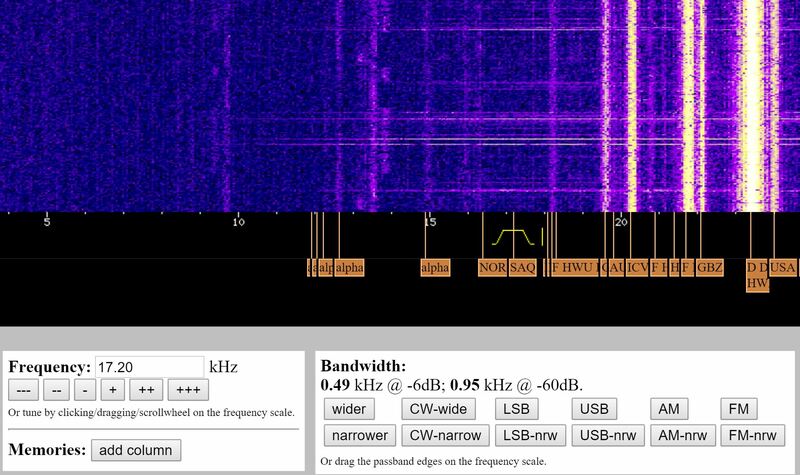 There are receivers around the world who regularly outputs a 15 second “snippet” of the received signals in the frequency range up to 24 kHz on the Internet. Here you can “zap” around and see how the SAQ transmitter reaches different parts of the world. If you want to see a receiver of a different kind, take a look at Jim Moritz’ mechanical receiver. How does it sound like when you receive a SAQ transmission? SAQ sends Morse code (combinations of short and long pulses) with an unmodulated carrier. This means that you normally do not hear a tone, but more likely a variation of noise on the transmission frequency 17.2 kHz. Receivers for telegram traffic are normally equipped with a so-called beat oscillator, which allows the carrier is audible in the receiver. The tuning (alignment) of the alternator before a transmission can be challenging. If not “reaching all the way” during the tuning, it may result in a “sound” at the reception characteristic of a machine transmitter: Morse characters sound like “chirp-chirp”, and not as clean “beep-beep” as desirable. We are better at transmitting than receiving, so we would love to hear your tips and comments to help everyone to a successful reception of the SAQ. Mainly we want corrections of factual errors. Moreover, we want to exchange experiences and knowledge on the reception. Is it necessary to protect the sound card from damage via antenna, and if so, how? Is there a sound card that does not work for the reception of the SAQ? What other pitfalls to be avoided? Tips on simple antenna designs as well as tips on other tools to receive SAQ (eg, a single converter) is of course also welcome. Write to us in our Forum.